Disclosure: This post was sponsored by Align as part of an Influencer Activation for Influence Central and all opinions expressed in my post are my own. Most moms are good at putting our family’s health and well-being first. This can mean everything from making sure that everyone eats a good breakfast and dinner to putting the kids to bed at a decent hour every night. But one of the things I typically don’t think about enough is my kids’ digestive health. I mean, I do in a general sense. I make sure they’re eating fruit and vegetables, eating three meals a day, drinking water — you know. The basics necessary for survival. But I’ve never really thought specifically about how to help with their digestion — even when I was taking probiotics myself. 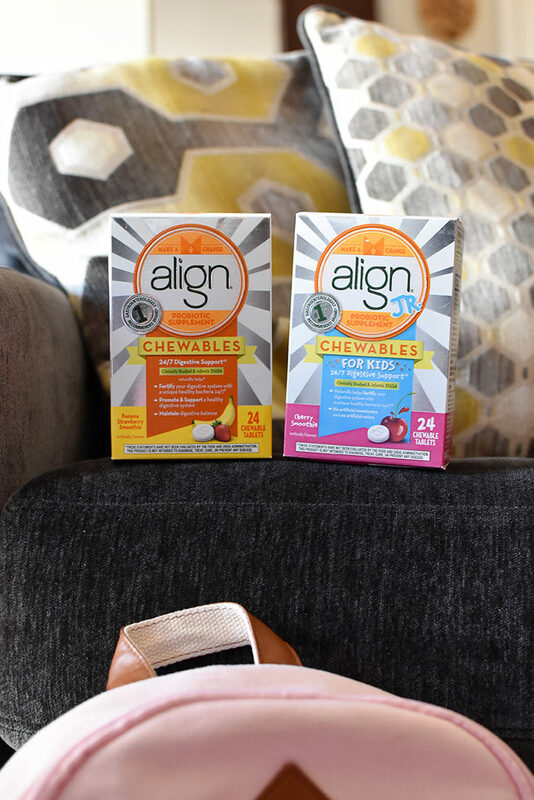 When I learned that Align also makes a chewable probiotic supplement for kids ages 6-12, Align Jr., I finally started thinking about how I could help my kids achieve healthier, more harmonious digestion. Align is the #1 Doctor and Gastroenterologist-recommended probiotic brand‡. 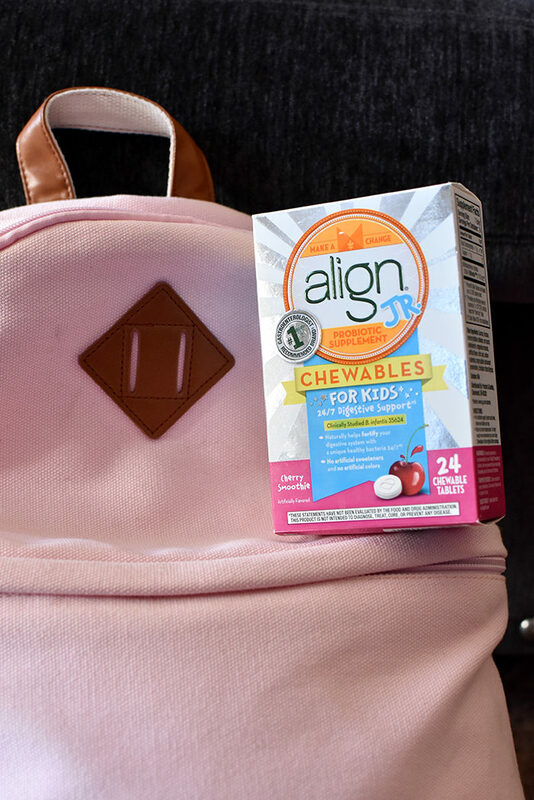 Align Jr. is a cherry-flavored chewable for kids that is meant to be taken once a day. My kids already take other chewable vitamins daily. 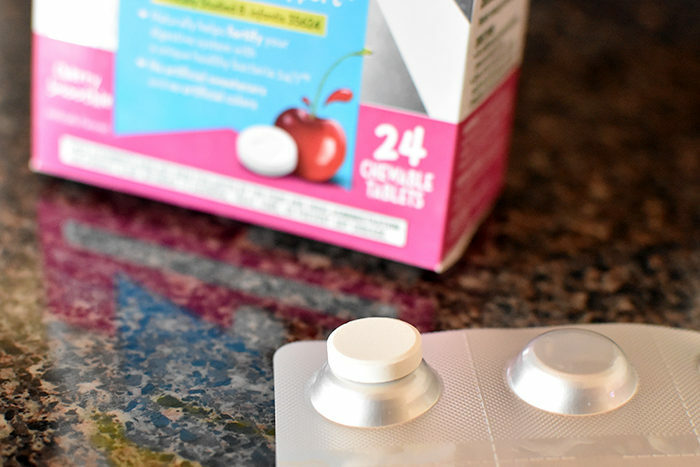 So could improving their digestive health really be as simple as adding Align Jr. to my middle schooler’s existing morning routine, right along with the chewable vitamins that she’s already happy to take? As it turns out, adding it to her routine really was that simple. Even if your kids aren’t used to taking supplements, you can just remind them that it is cherry smoothie flavored, which will make it sort of like a tiny treat every time they take it. And for your peace of mind (and mine), there are no artificial colors or sweeteners included and it’s gluten free. Sounds like a win-win-win. (I’m not sure exactly who the last “win” is for, but it just felt right). So what exactly are the possible benefits of taking a probiotic, much less giving one to your kids, right? Well, everything from what we’re eating to stress, general busyness and changes to our routines can all wreak havoc on our digestion. And in my experience, no one wants an angry digestive system. Probiotics are designed to help minimize the angry. They introduce good bacteria to our systems that provide a health benefit and are essential for many vital body functions, including healthy digestion*. And everyone feels better when their digestion is moving along as it should. Why wouldn’t we want the same for our kids? If you’d like to try Align Jr., don’t miss the chance to use this $5 off coupon.